The Varina Cubic Zirconia Asscher Cut Trapezoid Baguette Solitaire Engagement Ring is featured with a 5.5 carat asscher cut center stone that exhibits a traditional elegance with a sophisticated design. 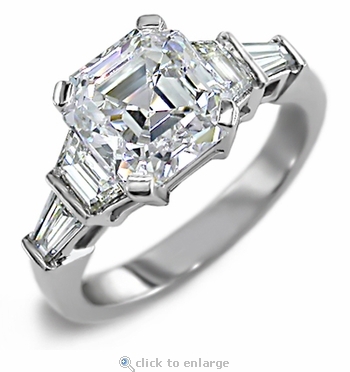 This engagement ring is accented by custom cut simulated diamond cubic zirconia trapezoids followed by a single tapered baguette on each side. The pictured 5.5 carat asscher cut center stone measures 10x10mm and includes approximately 7 carats in total carat weight. 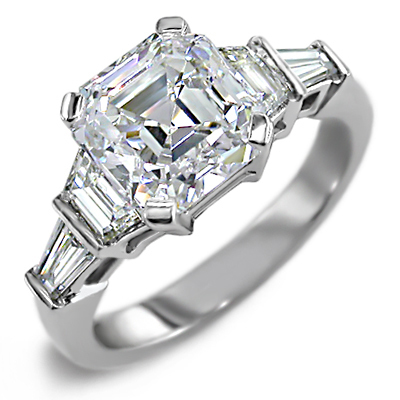 The Varina engagement ring is also available with a 2.5 carat (8mm) asscher cut with approximately 4 carats in total carat weight or a 4 carat (9mm) asscher cut with approximately 5.5 carats in total carat weight, please see the pull down menu for options and pricing. Our Russian formula hand cut and hand polished diamond quality cubic zirconia is cut to exact diamond specifications and set to perfection. This ring is available in 14k yellow gold, 14k white gold, 14k rose gold, 18k yellow gold, 18k white gold and luxurious platinum in whole and half finger sizes 5 through 8. Larger and smaller carat sizes and finger sizes are available. For further assistance, please contact us directly at 1-866-942-6663 or visit us via live chat and speak with a knowledgeable representative.